Shale gas in China could become a game changer. With recoverable resources of up to 36.1 trillion cubic meters, China has the world’s largest deposit of shale gas, and if accessed properly, it could turn its energy problem on its head. China’s economy runs on coal. In 2011, China produced 3.8 billion tons of coal, almost half of the world’s total. But coal’s carbon footprint is devastating in terms of global warming – 1 ton of coal produces up to 2.86 tons of carbon dioxide. Shale gas emits about 45 percent less per unit of energy and could thus help China to reduce its carbon footprint significantly. China’s shale gas exploitation is still at a nascent stage and its drillings are mostly exploratory, and it has not yet started large-scale commercial production. But it released its first five-year plan for shale gas exploitation in March 2012, which has ambitious goals. By 2015, the country aims to produce as much as 6.5 billion cubic meters of shale gas a year, which would be equivalent to 3 percent of China’s total gas production in 2015. And by 2020, it intends to produce up to 100 billion cubic meters of shale gas. A major obstacle in accessing shale gas is technology. Shale gas is produced through hydraulic fracturing, commonly known as fracking, which is highly sophisticated and complex. Only the United States has been able to exploit shale gas commercially on a large scale, which means China has to enter strategic partnerships with foreign governments and/or companies, at least in the initial years, to acquire the technology and skills necessary for rapid shale gas exploitation. Indeed, the US and China launched a joint shale gas initiative in 2009, PetroChina entered a long-term partnership with BP in July 2010, and Shell signed its first production-sharing contract for shale gas with China National Petroleum Corporation in March 2012. Besides, Statoil is in initial talks with Shenhua Geological Exploration to jointly develop shale gas projects, and Chevron and ConocoPhillips are engaged in Chinese shale gas joint ventures. These partnerships are likely to boost China’s technological capability significantly. But even with mature and competitive equipment, China may not be able to duplicate the American shale gas revolution because of shortage of water. Producing shale gas requires massive amounts of water, which become heavily contaminated. And water is scarce in China, especially in regions that have the largest shale gas reserves. For example, the Tarim Basin in the Xinjiang Uygur autonomous region holds some of the largest shale gas deposits but it is also among most water-scarce areas of China. What role does water play in the shale gas production? Large amounts of water, fine sand and chemical substances have to be injected into the ground under high pressure to break shale rocks to release the gas trapped in them. The International Energy Agency estimates that fracking may require up to 20,000 cubic meters of water per well. Therefore, shale gas rigs usually operate near large reservoirs, not in water-scare areas. The water problem, however, could be solved by setting up closed loop systems. Depending on the geology, between 20 and 50 percent of the water injected in the ground flows back to the surface. Simply re-injecting this wastewater may reduce a well’s total water requirement significantly. In western Texas, the average water use per well has decreased from about 18,500 cubic meters to 13,600 cubic meters because of increased re-injection of wastewater. Re-injection could also solve the second water problem associated with shale gas: contaminated wastewater. The wastewater contains not only the chemicals originally injected into the ground, but also heavy metals and minerals from shale rocks. Scientists disagree whether it is possible to recycle all the wastewater that fracking generates, but re-injection could solve this problem to a large extent. Re-injection, however, may not solve the third water problem. If water is not injected into the ground properly, it could cause the injected fluids and chemicals to seep into groundwater and surface water. A study undertaken by Duke University in Pennsylvania shows shale gas production could seriously contaminate groundwater, and that methane concentrations in drinking water were 17 times higher within a 1-km radius of an active shale gas well than those farther away. Methane is a dangerous and inflammable gas, and consuming water with high levels of the methane can lead to a variety of health implications such as nausea and dizziness. Also, being a dangerous greenhouse gas, methane traps 20 times more heat in the atmosphere than carbon dioxide. Since shale gas production in China is in its infancy, there is no comprehensive regulatory system in place. But with the country now auctioning exploration blocks, a sound shale gas regulatory system is needed to ensure long-term exploitation. Moreover, China must manage its water resources carefully because it is already facing serious water scarcity. For example, the Water Resources Group, led by McKinsey & Company, projects that if China continues with its business as usual practices, its demand for water will soon outstrip supply by 199 billion cubic meters. A regulatory framework for shale gas should be established to set strict standards for the maximum amount of water that can be used by a well, and measures have to be taken to prevent the shale gas industry from competing with Chinese citizens for water. Steps should be taken to compel companies to adopt the most water-efficient technologies and disclose the amount and toxicity of the wastewater they generate. And the companies should be encouraged to re-inject as much wastewater as possible and obliged to reveal the names and quantities of chemicals they use. More importantly, baselines for key environmental indicators such as groundwater quality before fracking should be established so that water quality can be monitored reliably. 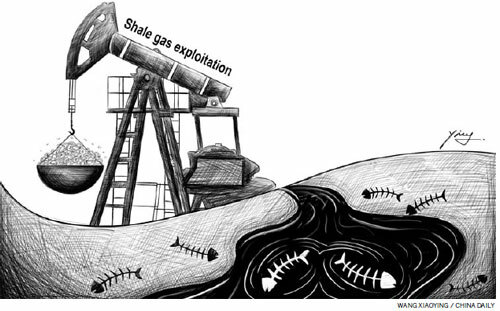 Only when such regulations are in place can exploitation of shale gas in China benefit the current as well as the future generations. Asit Biswas is a distinguished visiting professor at Lee Kuan Yew School of Public Policy, Singapore, and founder of Third World Centre for Water Management, and Julian Kirchherr is a graduate student on public policy and management at the London School of Economics and National University of Singapore.